One of the most innovative features of WISE involves QR bar codes placed at key locations on a machine. Scanning the QR bar code with a smart phone or tablet will connect the operator or maintenance person with the most up-to-date information on maintenance procedures, troubleshooting, and adjustments for the section of the machine covered by that QR bar code. This approach utilizes the power of the cloud to deliver current and evolving information, including video, without the hassle or potential security risk of networking the machine to the internet. Wexxar will also showcase at Pack Expo a stainless steel BEL 505 semi-automatic case former/hand pack station and BEL 150 pressure sensitive case sealer combination at Pack Expo. This combination allows one operator to form, pack, and seal corrugated cases quickly and effectively. Stainless steel construction is ideal for wash down and other harsh environments. 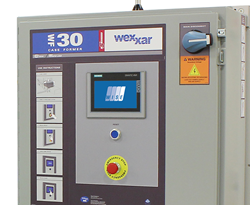 For more information about Wexxar’s full line of case erecting and sealing machinery, call 604-930-9300 and visit http://www.Wexxar.com. Be sure to stop by the Wexxar/BEL at Pack Expo, Booth S-3742. Wexxar/BEL is a leading manufacturer of high quality systems for case forming and sealing for the most demanding packaging operations. Wexxar and BEL products yield the lowest cost of ownership through greater dependability, higher productivity, maximum throughput, and a high standard of safety. Wexxar/BEL is headquartered in Richmond, British Columbia, Canada. For more information, visit http://www.Wexxar.com.